Cubietruck is the third generation of the famous Cubieboard, and is the most full-featured board to date. The board helpfully states "CUBIETRUCK". There are two revisions of the A20. Since Feb 2014 it is RevB. The Rev state is not printed on the board and is not retrievable from the SoC. There is also no information regarding the differences of these revisions. There is evidence of different behavior and boot problems with older kernel on RevB cubietrucks. Mostly supported. See Tips, Tricks, Caveats below for more details. Instruction to make ArchLinux ARM images for Cubietruck. Use the Cubietruck build target. Use the sun7i-a20-cubietruck.dtb device-tree binary. There is a button marked 'FEL' next to the full-size usb ports, which triggers FEL mode. The Cubietruck is the only board to date that has a properly implemented VGA connector with DDC. Load-detection is also reliable. In future kernel versions (with sunxi-kms), VGA and the attached monitor will be detected properly and will require no intervention. For now though, you need to edit the FEX file still. There is one issue with VGA though. Due to bad PCB placement, there is some crosstalk between Wifi and VGA in certain videomodes. <tomee^> arokux: I simply do not know why 432MHz if the hardware can do 480... they downclocked it for security purposes in the first batch? <arokux> tomee^: sorry, I have no idea. <arokux> tomee^: Turl may know. See this conversation on memory frequency problems. For the linux-sunxi's 3.4 kernel, you will need a special driver, instructions to integrate and compile the AMPAK AP6210 Wifi and Bluetooth driver with the sunxi-3.4 source code are avalable. The Lubuntu Desktop images has NetworkManager running. It spawns its own wpa_supplicant, which is respawned once you kill it. This wpa_supplicant will also interfere with yours, if you want to configure WLAN Adapter by yourself. I have removed NetworkManager and was able to successfully configure WiFi. This is a new or differently wired chip, status UNKNOWN, please test it! Tha battery backups the power supply. It allows an uninterruptible operation. Depending on the battery capacity several hours of operation are possible. The battery will be charged during operation. A 3.7 Volt Lithium polymer battery is needed. The JST XH 0.1"/2.5mm connector is near the ethernet port (see frontside board pictures). The battery capacity in mA has to be set in the fex file. The cubietruck is prepared to power directly a 3.5" HDD with Cubietech's optional 3.5 inch HDD addon package. Unlike other sunxi boards that feature an onboard SATA-power-connector suitable for powering 2.5" disks the Cubie solution is able to feed 3.5 disks that need both 5V/12V from a single 12V power source (using a 5.5/2.1 power barrel). The Addon board contains a step-down converter supplying 5V on 2 USB type A ports (from where you can feed the board using an USB-to-4/1.7mm-cable) and provides 12V on a JST XH 0.1"/2.5mm header. An identical header on the Cubietruck routes the 12V to the SATA connector on the board's edge (see gallery below). Both 5V and 12V power connectors towards disk also use the JST XH 2.5mm header. Banana Pi/Pro/M1+, Orange Pi, Orange Pi Mini and pcDuino3 Nano use all the same JST header to provide 5V to a SATA disk. But only the pcDuino uses the same polarity, on Bananas/Oranges 5V/GND are inversed! So you could use Cubietech's 3.5 inch HDD addon package with pcDuino3 Nano or use the 2.5" SATA-power kits available for the pcDuino with Cubieboards without modifications. But due to different polarity the different Pis are incompatible and would require cable modifications. There are kernels developed by Cubietech, they are supposed to have all features working. Reportedly AP mode does not work with the WiFi driver in this kernel. The cubietruck exposes 2 2.0 mm pitch connectors with lots of expansion possibilities. There is a nice 0.1" connector behind the USB ports, just plug in your UART adapter. The cubieboards are a well known brandname nowadays and there are no rebadgers. 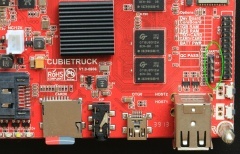 The Cubietruck is also known as Cubieboard 3. This page was last modified on 27 September 2018, at 22:33. This page has been accessed 210,606 times.